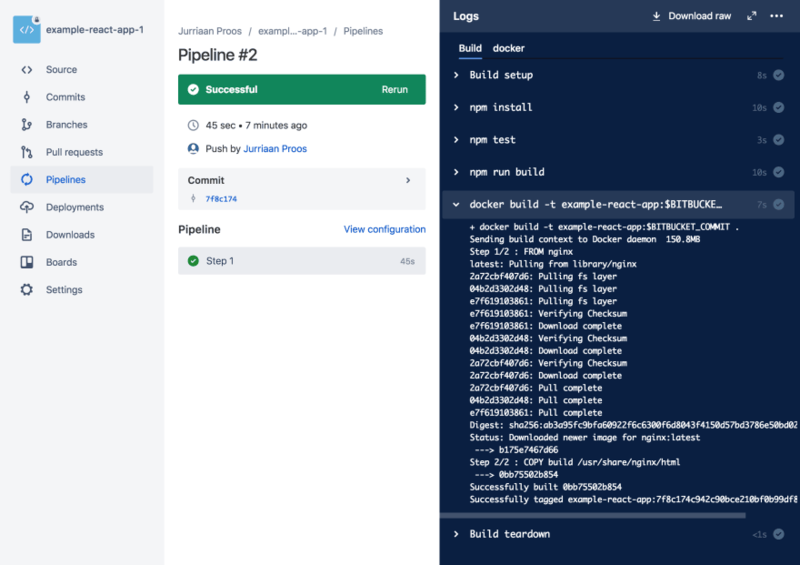 So I recently played around with Bitbucket Pipelines to see what its capabilities are and to see whether I could quickly set up (within 1 day) a complete CI/CD pipeline for a React app. Here's the result! Once you've clicked Create repository, an empty repository will be available to you. 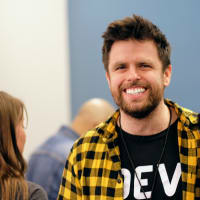 Using create-react-app, create a new React app. We are not going to add any functionality, so leave it as is. You could verify that it has been created successfully by running npm start or yarn start and then browsing to http://localhost:3000 to view it in the browser. 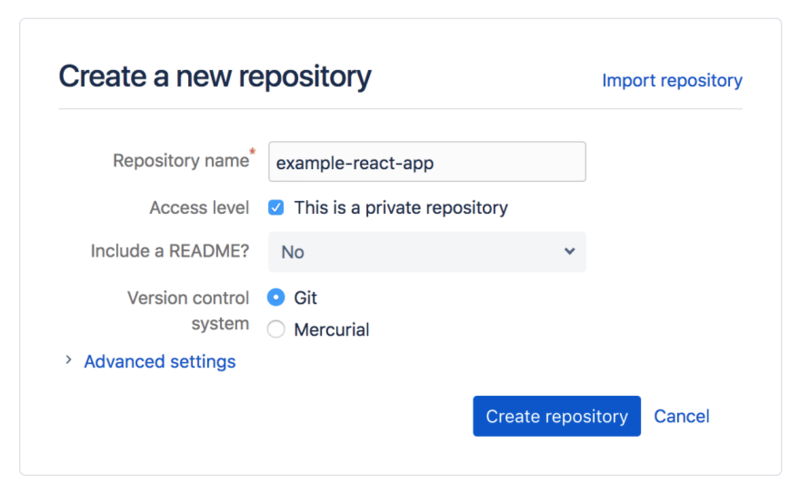 In the newly created React app, initialize a Git repository. 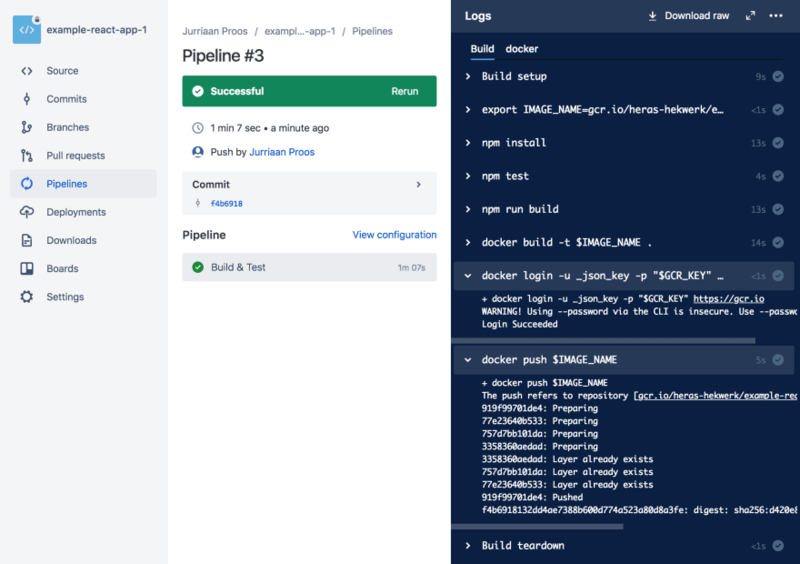 Then push all code that is in the folder to the remote, so we can get going with Bitbucket Pipelines. Now in your newly created Bitbucket repository, click on Pipelines. Then in <directory-of-react-app>, use your favorite text editor to create a bitbucket-pipelines.yml and paste the template. Add npm run build to the scripts section to build a production ready version of the React app which we will use later to package the application in a Docker container. Commit and push the file and verify on Bitbucket whether it is picked up by the Pipelines addon, by clicking on the Pipelines tab. 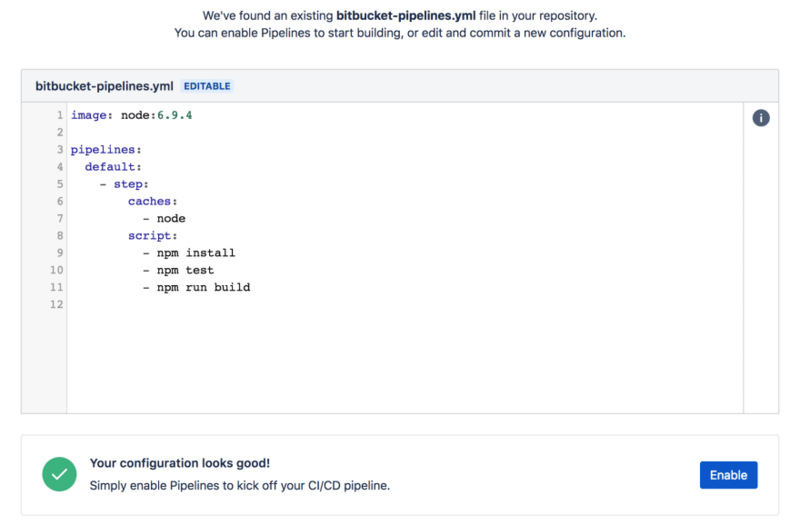 git commit -m "Added bitbucket-pipelines.yml"
Click Enable to kick off your first build! If all goes well, you should end up with a screen like this. Investigate the logs of the steps executed so you get a feeling with the UI and know where to look when problems occur. We want to deploy our React app to Kubernetes, therefore it is required to package the application in a Docker container. - docker build -t example-react-app:$BITBUCKET_COMMIT . 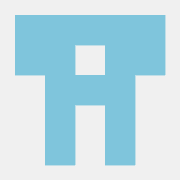 The $BITBUCKET_COMMIT environment variable automatically gets filled with the commit hash. Commit and push your changes and wait for it to build again. Once again, if all goes well, you should end up with a screen like this. One difference from the previous screen is the docker tab next to the Build tab in the Logs overview. This is the docker daemon that gets launched with your build to be able to run docker commands. The next step is to push the Docker container to a registry. We could push this to Docker hub, but because we want to learn new things we will be pushing this to a private Google Container Registry (GCR). Open up the Google Cloud Console and go to Container Registry (under Tools). If asked, enable the API. To be able to push images to the registry from Bitbucket Pipelines, we'll be using a JSON key file to authenticate. Under IAM & admin > Service accounts, create a service account with roles Storage Object Creator and Storage Object Viewer enabled. Once created, in the service account overview, click on the menu in the Options column and click on Create key. Choose JSON as Key type and save the key to your desktop. We're going to inject these credentials into the build as a secured environment variable. 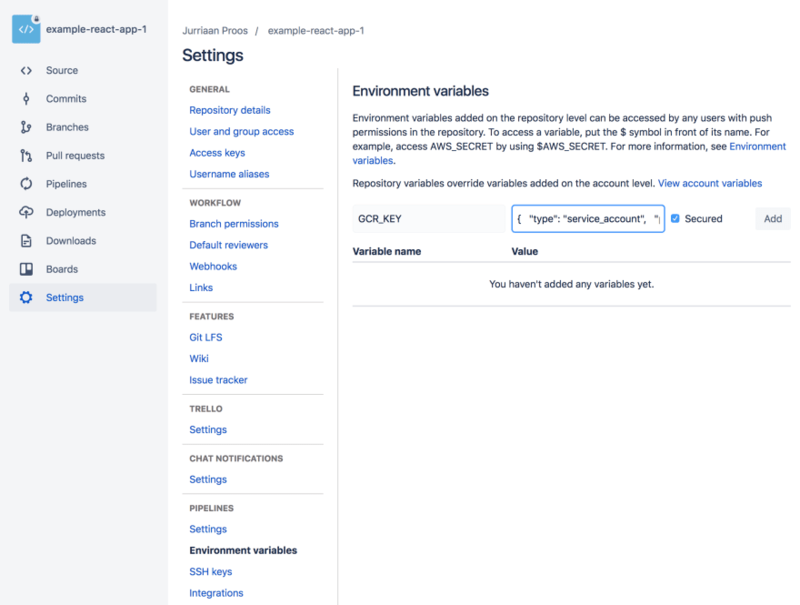 Open up the Bitbucket project and click on Settings -> Environment variables and add an environment variable (e.g. GCR_KEY) with the contents of the JSON key file as value. Check the Secured checkbox and click Add. We've added a few steps to the script section and gave our step a name. The changes are rather self-explanatory, so let's commit and push our changes and wait for the build to run! As can be seen, we're succesfully logged in with the service account and are able to push the container to the registry. Next up, deployment! Create a Kubernetes cluster and configure your terminal to be able to communicate with it using kubectl. If you then run kubectl get po, you will see that the pods have status ImagePullBackOff, because we haven't pushed a container with tag latest. This will be fixed as soon as we setup the rest of the CD part in our Bitbucket Pipeline. To authenticate against the Kubernetes cluster we're going to use a service account for Authentication and RBAC for Authorization. 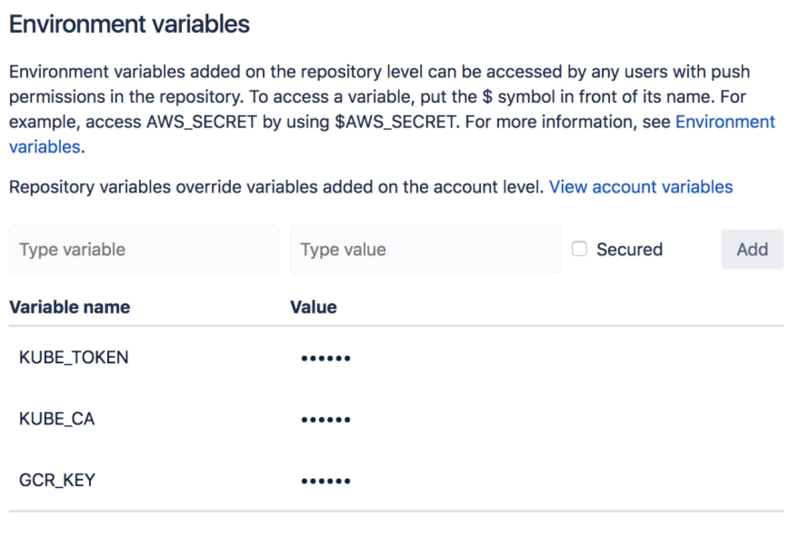 Copy the value behind ca.crt and create a new Secured environment variable called KUBE_CA in Bitbucket. Do the same for the value behind token and call it KUBE_TOKEN. Then create the following Role and RoleBinding objects to allow the serviceaccount to deploy new versions of our app. Once that is done, we can continue with configuring the Pipeline to deploy the new image. - kubectl config set-cluster <cluster-name> --server=<address-of-cluster> --certificate-authority="$(pwd)/kube_ca"
- kubectl config set-credentials bitbucket --token="$(cat ./kube_token)"
This downloads kubectl into the container that is used during the build proces, configures it using information extracted in previous steps and then deploys a new version of the application using kubectl set image. The address of the cluster can be found using kubectl cluster-info. 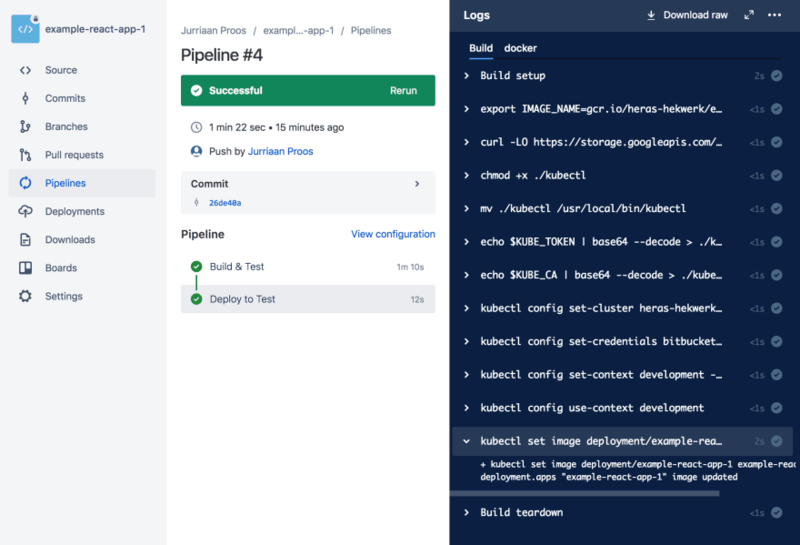 Commit and push these changes and wait for Bitbucket Pipelines to do its magic! You can further investigate the pods belonging to the deployment to check whether they are running the correct container by using commands such as kubectl get po and kubectl describe po <pod-name>. 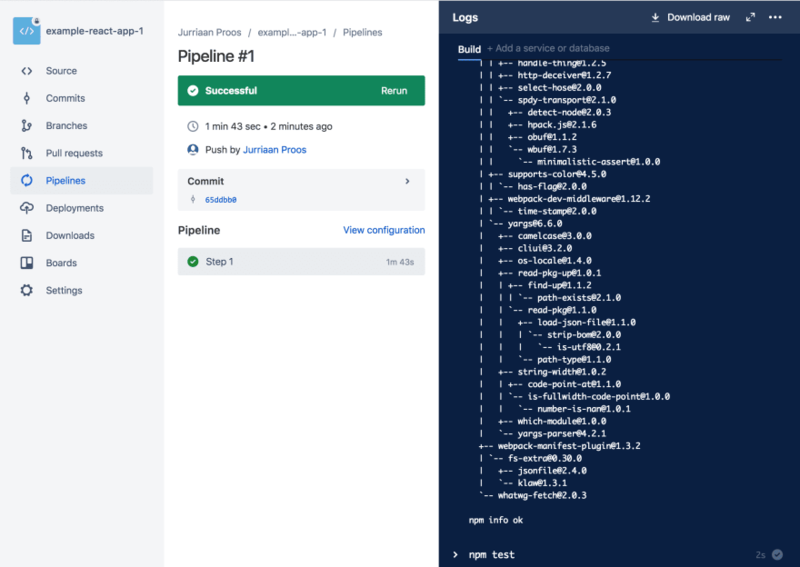 We've setup a complete (but simple) CI/CD chain for a React app using Bitbucket Pipelines and Kubernetes! It took me a bit more than a day to figure some things out because I've made certain parts of the setup more difficult for the sole purpose of learning new things (using service accounts/RBAC over Basic HTTP Auth etc.)! Thanks for reading, happy CI/CD'ing! However I found it easier to download gcloud and configure the kubectl credentials with "gcloud auth activate-service-account" (with the same serivce-account-key $GCR_KEY). I followed the instructions here: gist.github.com/adilsoncarvalho/e0... .